Sapling of Colfenor ($25.98) Price History from major stores - Eventide (Foil) - MTGPrice.com Values for Ebay, Amazon and hobby stores! 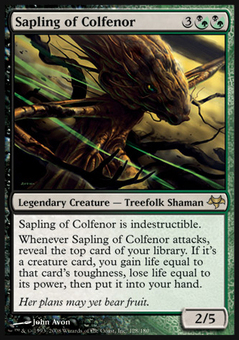 Card Text: Sapling of Colfenor is indestructible. 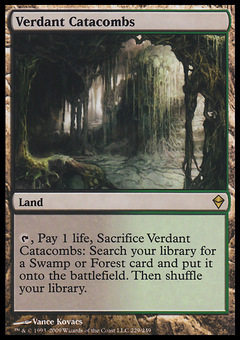 Whenever Sapling of Colfenor attacks, reveal the top card of your library. If it's a creature card, you gain life equal to that card's toughness, lose life equal to its power, then put it into your hand. Flavor Text: Her plans may yet bear fruit.